Preheat oven to 375˚. Crush the candy canes by running them through a processor or placing them in a plastic bag and hitting them with a rolling pin until finely crushed. Set them aside. In a small bowl, mix the flour with the baking soda. In a large mixing bowl, whip the butter. Then add the sugar and whip until creamy and fluffy. Add the egg and whip until light and fluffy. Next, add the milk, vanilla and salt. Turn the mixer on low, and gently mix in the dry ingredients until combined. Separate the dough in half evenly, and place one half in another bowl. 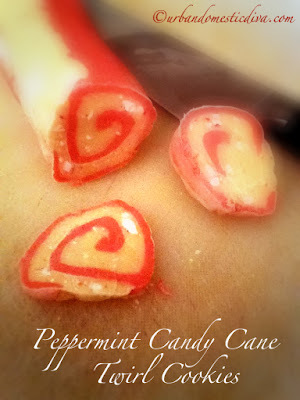 In one half, add the peppermint extract and red food coloring. Mix well until everything is combined evenly. In the other half, add the crushed candy cane bits, mixing until well combined. Roll the red dough with a light dusting of flour to about 12 x 6 or so on lightly floured plastic wrap. Do the same with the candy cane half. Flip the candy cane dough on top of the red dough, matching edges as well as possible. Using the long side, beginning rolling the dough into a tight log. Cut in half. Wrap each log in saran wrap, and roll each back and forth until they are even in thickness. Chill for a few hours, or freeze. Let the dough sit at room temp for 5 or so minutes before slicing. Feel free to roll log in some red or pink colored sugar for garnish before cutting. Using a serrated knife, slice off pinwheels, about 1/8 inch thick. Rotate the log around as you cut so things stay circular. Place pinwheels on a cookie sheet a couple inches apart. Bake until lightly golden on the edges, about 8-10 minutes. Remove cookie while still warm and transfer them to cool on a wire rack.